So we had our weekly small group today. Rose, our host, always makes some kind of delish cuisine for us to partake of upon arrival. Today we were treated to a variety of eggroll along with the usual of tortilla and salsa (mmm salsa). There was chicken eggroll enveloped in a spanish-flavor of black beans and other black-like substance. Quite good. There was also the generic eggroll. 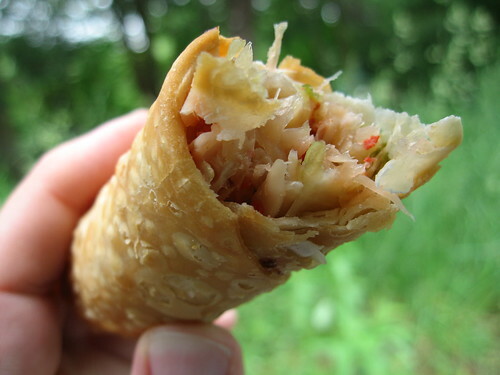 Upon initial consumption of it, someone – I forget who – asked what is generic eggroll composed of? Cabbage, I said, and we partook. Now it is quite common knowledge that cabbage produces a…. gaseous…. effect… And I must say that the generic eggroll had a hint of an unnatural generic eggroll taste. I couldn’t put my finger on it. Well, all we know is that by the end of the group, a significant portion of us were suffering from abdominal pain of cataclysmic proportion. I can’t even fully describe to you with human words the anguish that was expressed on the ride home. Perhaps I exaggerate on the severity, but trust me… it was pretty bad. There was also the feeling, by many, that there may be some explosive gaseous release shortly to follow. It happened to too many of us all at the same time for it to be coincidence. I believe that the cabbage-product contained within the generic eggroll may be the culprit. In fact, I am quite sure of it. Someone had poisoned the cabbage! A Scripture that has been previously mentioned in this blog, I believe, is well applicable. “Oh man of God, there is death in the pot!” (2 Kings 4:40). Follow the link to read the full story. Well, tonight I was sick; coughing, sneezing, and such. Something, however, tells me that I still fared better than the lot of you. Wow…..I’m sorry I missed such gaseous anomolies last night. Lol!